The overarching goal of this project is to advance the field of generative modeling, i.e. to build methods that learn complex probability distributions. In particular, we focus on generative adversarial networks (GANs), a relatively new technique that has shown impressive results in purely data-driven modeling of images. “How do I look?” – this is a question typically asked when someone tries a new type of clothing or shoe. It emphasizes that visual appearance is key to fashion. The look of fashion can even be more important than fit and size: many people are willing to trade worse fit with better looks, in particular for short-term or singular events. In a digitized world, a look is represented as an image in a computer. The research focus and purpose of this project is to generate and manipulate images related to the fashion domain by using Machine Learning (ML). ML is a set of methods to learn from data and model high-dimensional probability distributions. Images with millions of pixels are a domain where these techniques are very useful. In addition to classical computer vision (e.g. face detection), ML is changing the way we interact using images with computers and smartphones. Style exploration can be such a novel application utilizing computer vision that fundamentally changes how we experience the fashion world. The following Figures show example generated images from this proposed method. 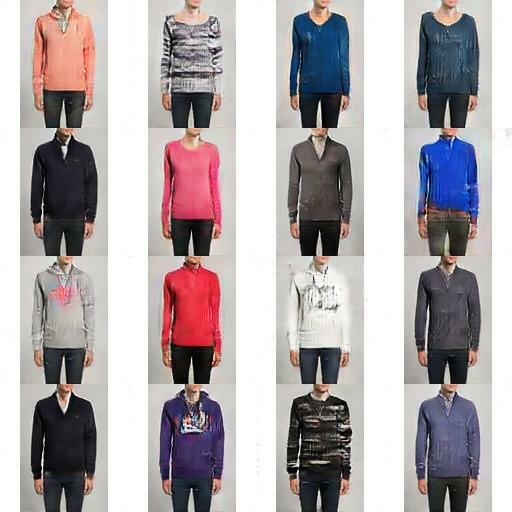 A single fashion item (orange pullover) can be combined with multiple human models. This enables exploration of how it will look on different people. A single human image will be combined with different upper body garments, exploring which of them looks best on the human. We’re constantly pushing the limit by advancing methodologies – and since the mentioned publication made significant progress towards better image quality. See for yourself in the next Figure. The leftmost human image should wear the second-left article. The right image is the final result. Our improved methods for Model Transfer increase the image resolution and keep more texture details. We’ll soon publish our latest approach – so watch our homepage if you want to know how this is achieved!